Taking a break from Meghan today, I thought I’d shine a light on the style of Duchess Catherine instead! Kate wore this tailored, casual look while on a visit to Basildon Sporting Village with Prince William at the end of October. Her two-button blazer is by Smythe, which is a brand favored by both Duchesses! While her exact plaid blazer is sold out, Smythe has this nearly identical style with the same blackout collar as Kate’s. The only difference is a slightly different color scheme in the plaid, but a great work-to-weekend basic all the same! She paired the look with black skinny jeans, a cozy black turtleneck and comfortable ankle boots for the outing. 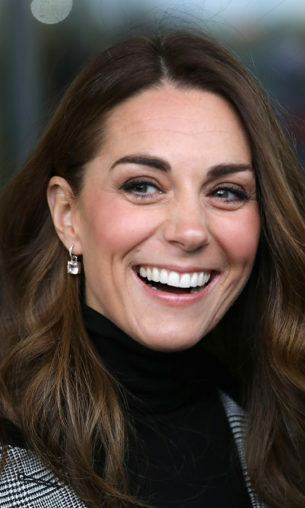 I also really am loving the earring look here – such gorgeous diamond drops! It’s not often we see either Duchess is casual ensembles like this, but I really enjoy it. It gives us a glimpse into what their everyday style actually is when they’re not participating in fancy royal engagements. Plus, they’re really easy to recreate featuring items in our own wardrobes! I found some great lookalike blazers for a fraction of the price of Kate’s style below, and have linked a few similar pairs of boots, jeans and earrings as well!